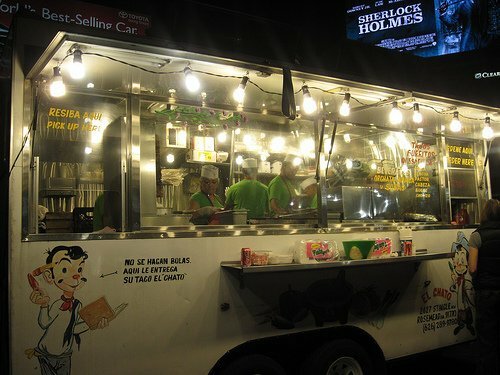 Los Angeles invented the modern food truck movement. That’s undisputed. 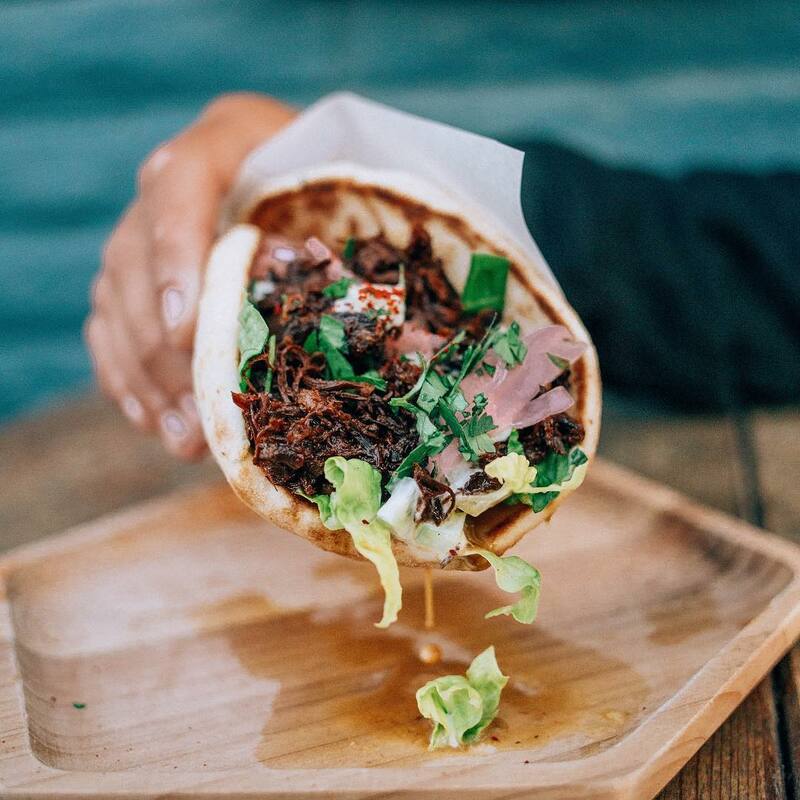 But a decade into this street food renaissance, is it still leading the pack? The answer is…..debatable (Austin and Portland particularly might have some opinions), but by all accounts, there’s still no sunnier streets than LA’s for food trucks and the mouths that love them. Fusion cuisine no longer dominates the scene, as the fad of Kogi-inspired mash-ups burnt out quicker than you can say “Italian taco”. But in its place is a grown-up world of gourmet food trucks, where taste trumps trends and true innovation comes in the smallest details. The trucks that reign supreme here represent the best of what this city’s mastered long ago (like tacos and burgers), along with lessons learned from the worldwide movement that started on these blocks. 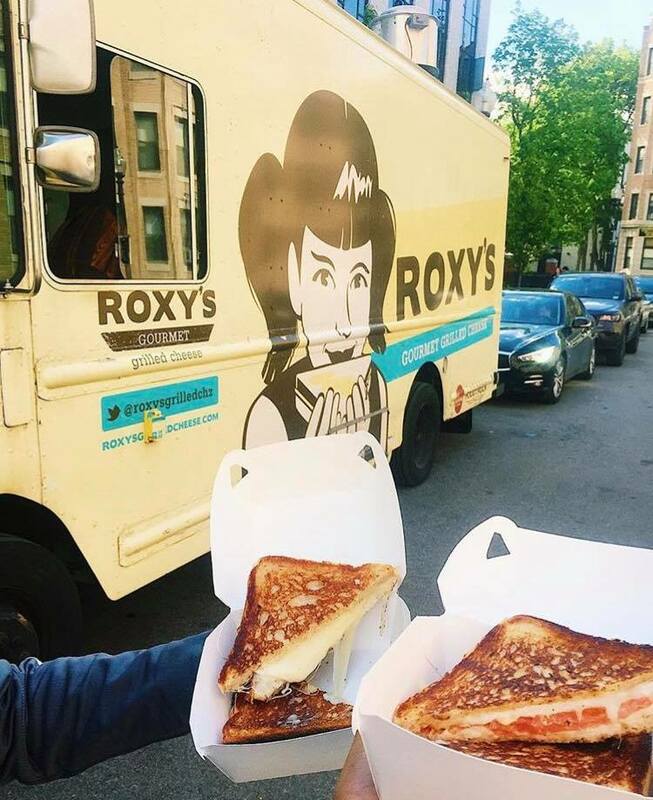 Below are 17 food trucks still worth checking Twitter for (and braving the crowds), or better yet – nabbing for your next party, so you can have the best all to yourself. Chef Lee of Smokehouse Lee and Chef Bivens of Soulo’s Kitchen were separately on the rise in South LA’s underground food scene. But once they joined forces, that rise became rocket-strapped. The Cajun Surf & Turf Burger was their first collaborative smash, and after 1900 Instagram likes, it was clear that they should stick together – and make a whole lotta burgers. Now with multiple trucks (including one in Vegas), the boys are out to make their namesake a reality. Nobody does burgers bolder (or simply bigger) on the streets of LA right now, with crawfish, lobster tail and mountains of onion strings no stranger to falling off these patties (and hopefully into your mouth). No matter what you get, if you’re savvy enough to track them down, you’ll find your mouth submerged in a Scrooge McDuck-sized money pool of serious flavor. The Jambalya Fries – Cajun seasoning and divinely cooked seafood make these already perfect fries flat-out otherworldly. Eight years ago, Chef Albert Shim launched his maximalist munchies from under a tent at the Long Beach Farmer’s Market, and the legend quickly grew. Fusing classic wings with diverse sauces and seasonings, Belly Bombz wants to take your tongue on a worldwide tour before sending it straight to delicious hell. It’s a trip with so many repeat passengers that Shim’s opened two brick and mortars (in Artesia & Whittier). But the truck’s the only way to snag these tastes in central LA, so chase it down to see what all the fuss is about. Bomb-Dust Wings – A Memphis-style dry rub makes these wings smoky, spicy and sweet, all at once. It’s a fuse you’re gonna wanna re-light again and again. Ricky’s Fish Tacos is a food truck with iconic history, and a best-in-town reputation that preceded the truck itself (by the better part of a decade.) Working from an old family recipe, Baja native Ricky Peña made his name in Silverlake by pushing a cart block to block and letting the taste speak for itself. It did a lot of speaking, as quickly Ricky’s began to top the most popular brick-and-mortars in town on Yelp and best-of lists, despite only operating two days a week (the other five spent in a flower shop). By the time Ricky’s expanded operations – to longer weeks and larger wheels – it felt long overdue. Now Ricky’s is truly mobile, and can be found frying up perfect simplicity from Silverlake to Culver City. Grab the taste that was food truck history before its food truck existed, and add a few chapters for yourself. Fish Taco – Ricky’s has spectacular shrimp options, and occasional specials, but don’t miss the centerpiece that started it all – Baja fish fried with a crispy-round-the-edges batter, and a thick and creamy middle. Shredded cabbage and a peppery pico de gallo lay the base for your choice of crema – from mild to mouth-melting, giving you full customization of your dream. 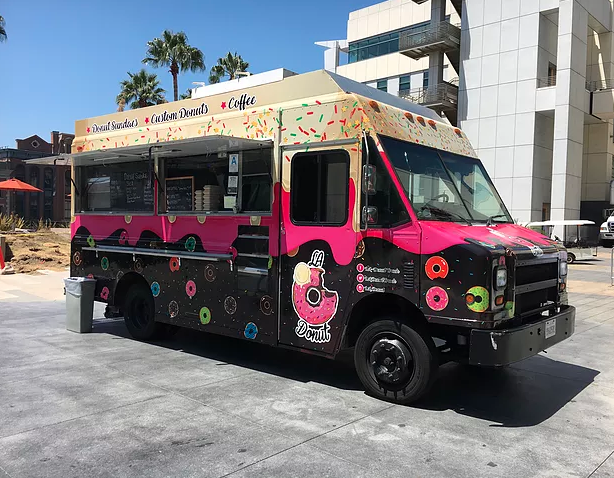 LA-Donut is a newer food truck, but it’s aiming to be just as much of an all-time classic as the rest here. Donuts are obviously the main draw onboard, but that’s just where LA-Donut begins. Its roster of strange and wonderful creations can be finished with your choice of ice cream, toppings, and chocolate or caramel sauce. What you’re left with is a donut sundae to end all donut sundaes – if any others were even worthy to begin with. An onboard espresso machine offers a near-equal amount of vast coffee options to pair with your sundae, while milkshakes round off the bevy of attractive alternatives. No matter which you choose, LA-Donut’s here to make your morning sweeter. And it’s a mission you can’t afford to miss. Donut Sundae – Endless possibilities add up to a treat you’ll, well, never want to end. For all the obvious reasons. 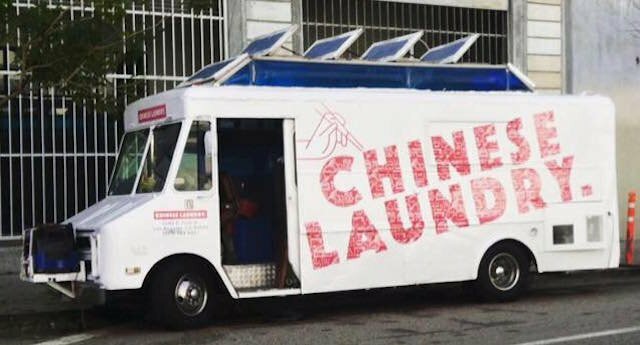 Launched by a San Diego chef who fell in love with a girl from Beijing, the Chinese Laundry Truck represents a union of two worlds: eastern tradition and western modernism. A menu of classic Chinese dishes, made new again through fresh technique and ingredients was launched between the pair, who started serving it at their own underground pop-ups. The venture was so successful that they quit their jobs….only to have their supper club evicted by the landlord. But the buzz they drummed up was far tougher to evict, and after a brief break to start a family, the Chinese Laundry Truck was officially born – bringing noodle bowls, pork belly, Hainan chicken and more to hungry mouths across all of LA. Check it out to get your fill of a delicious marriage that’s only getting richer by the year. Despite the name, the only things considered “healthy” at this institution are the portions, which are large enough to feed at least four. Chef/Owner Keith Garrett, aka Chef Ocho’s quesadillas are packed to the brim with shrimp, chicken, steak and all manner of mystery seasonings. Originating from his front lawn in Watts, Ocho’s offerings began to draw crowds so large he got shut down. So, like the Chinese Laundry Truck, Ocho decided to go mobile in order to go legit. Now All Flavor, No Grease is known across the whole 30 mile zone (and beyond), turning every stop he makes into the hottest pop-up in town. And this time, no one’s shutting him down. Shrimp, Steak & Chicken Quesadilla – Don’t get bogged down by silly things like choice when you can have it all. And trust us when we say, “all”. Bring a stack of napkins for this one. 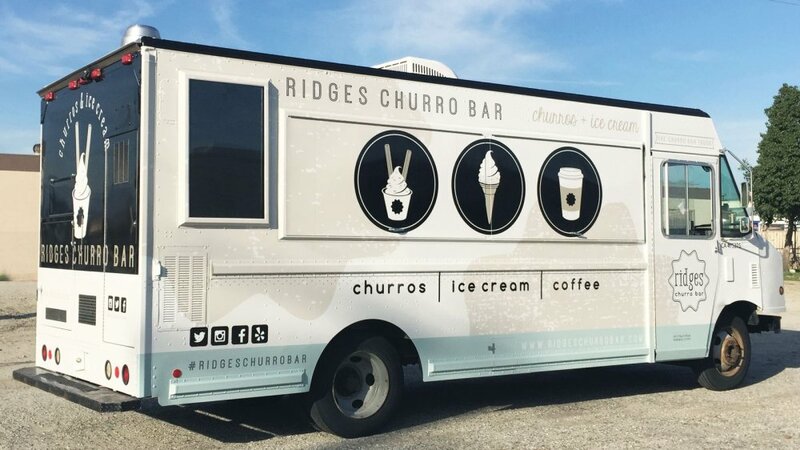 Launched by two high school sweethearts on a mission to refine the way LA does dessert, Ridges Churro made its debut at the Orange County Night Market in 2015, where it attracted an hour-long wait, along with a squadron of new fans. Eight months later, Ridges had graduated to a food truck, and the rest is history. Now Ridges travels through all of Southern California, punching up dessert and snack time with a variety of tastes and textures. In their hands, the classic cinnamon churro’s just a blank canvas for edible art – everything from white chocolate drizzle topped with strawberry dust and shortcake crumble, to cookie butter with chocolate and toasted marshmallow…..and beyond. Refinement never tasted so good. Caramel Churro – Churro smothered in Ghiradelli caramel, punched up by sea salt and plunged into fresh-churned soft serve, topped off with sugar dust and Frosted Flakes. It’s a dessert with a symphony of tastes that somehow all work together harmoniously. Born in Taiwan, owner Diana Yin developed a taste for American comfort food as she grew up in SF. 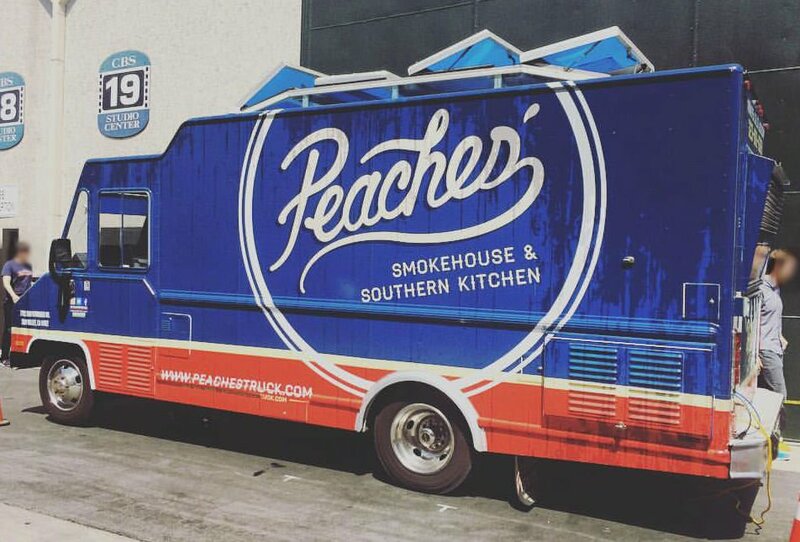 So much so that she put her love in motion, crafting Peaches’ Kitchen, which is serving up a more authentic slice of Southern charm than anyone else on the road in SoCal. A menu of mobile-friendly home cookin’ is built around slow-smoked BBQ and made-from-scratch fixings like pulled pork, mac & cheese and “red neck nachos”, along with intermediate eats like the country-fried steak sandwich. Stop by downtown sister restaurant Poppy + Rose to grab your fill of Yin’s brunch stylings, or track down the truck if you prefer your comforts come to you. Fried Chicken Sandwich – Buttermilk-brined chicken thigh topped with garlic aioli and house pickles, bringing you Sunday dinner b/w two buns. If you’re looking for ways Prince of Venice differentiates itself from the pack, you can start with the name – it’s quite literal. 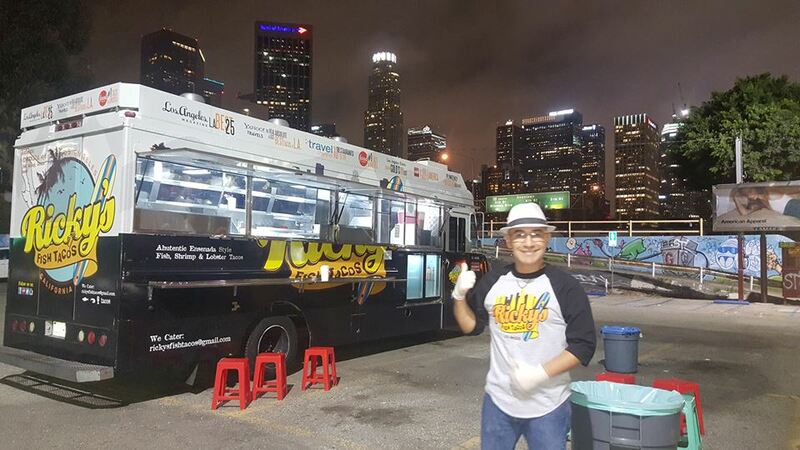 Launched by Prince Emanuele Filiberto (of yes, actual Italian royalty), the food truck’s mission is to fill a sizable gap in the LA food truck landscape – namely, the lack of quality Italian eats. Prince of Venice pairs high-quality SoCal ingredients like organic veggies and free-range meats with fine Italian flour, olive oil and truffles, all imported from the old world. A seasonal menu keeps things fresh, but hand-made pasta is naturally the truck’s strong suit. Whether you’re hunting Bucatini, Conchiglie or Spaghetti alla Puttanesca, the Prince has got you covered. It’s the class of Italian LA’s food truck community’s always deserved. And to be specific – that class is royal. Maccheroni alla Carbonara – Cured Pork Guanciale with eggs, Pecorino/Romano Cheese and black pepper; as savory as it is smooth. Our next truck on the list is by far the simplest. And that’s one of the reasons we love it. Launched by an east coast transplants couple fed up with LA’s froyo obsession, CVT is all about the minimalist art (begetting maximum flavor) of soft-serve ice cream. Vanilla, chocolate and swirl. And that’s it. When you do something this well, you don’t have to offer too many variations, and CVT does soft serve VERY very well. Check the truck out wherever it parks to get your mouth on its distinct taste – culled from a local dairy partnership, this ice cream’s creaminess deserves to be tasted on its own (which is why CVT offers minimal toppings). 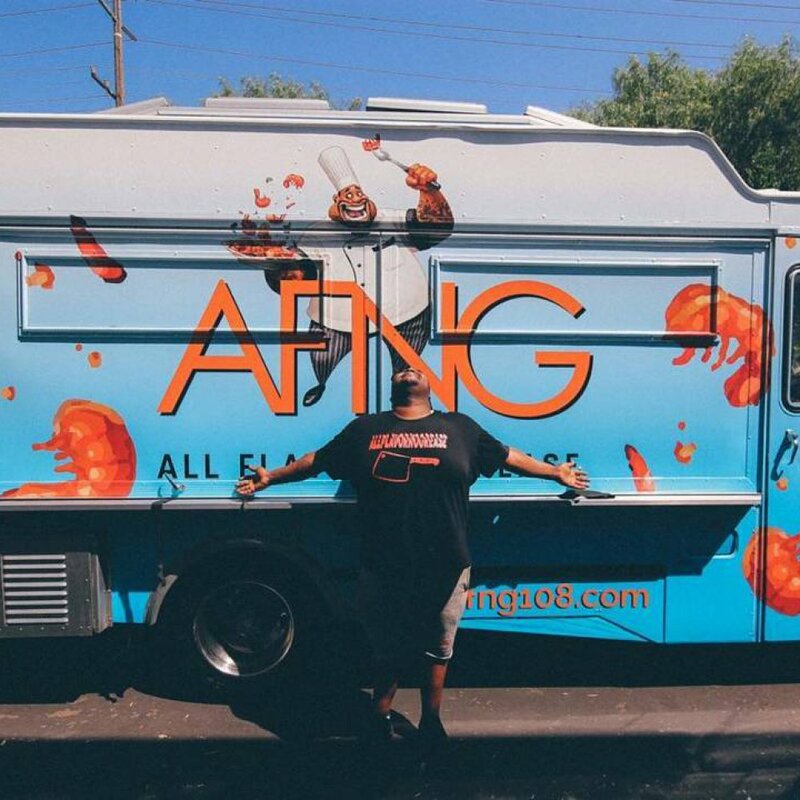 Altogether, CVT is one LA food truck that’s simply paradise. The Swirl – Of course. In this taco truck mecca, no pilgrimage is more sacred than a late-night trip to El Chato, where authentically-prepared tacos, burritos, quesadillas and more are all on hand to soak up booze and fuel early-morning revelry. One of the first trucks to popularize the LaBrea/Olympic food truck corridor back in 2006, El Chato quickly became known for its perfectly-marinated pastor, along with its trademark smoky chipotle. Pretty soon, the surrounding area filled up with dining options (from the original Umami to even fancier options north of Wilshire), but El Chato’s business only grew – spurred by hipster runoff from these flashier hotspots who quickly realized – wait, no THIS – is really what they were looking for all along. These days, El Chato routinely cleans up on local publications’ Best-Of lists (most recently taking LA Weekly’s #1 Taco Truck in Los Angeles crown), and has proven itself to have local staying power that’s outlasted 13 years of come-and-go trends. Al Pastor Quesadilla – Rounded off with grilled onions, it’s one of the most mouth-watering temptations on any street, at any time – late night or otherwise. Famously launched via Shark Tank, Cousins Maine Lobster is already a well-known institution, with trucks serving over 22 cities in the US, and a brick-and-mortar location in Weho. But the truck itself doesn’t let that go to its head. 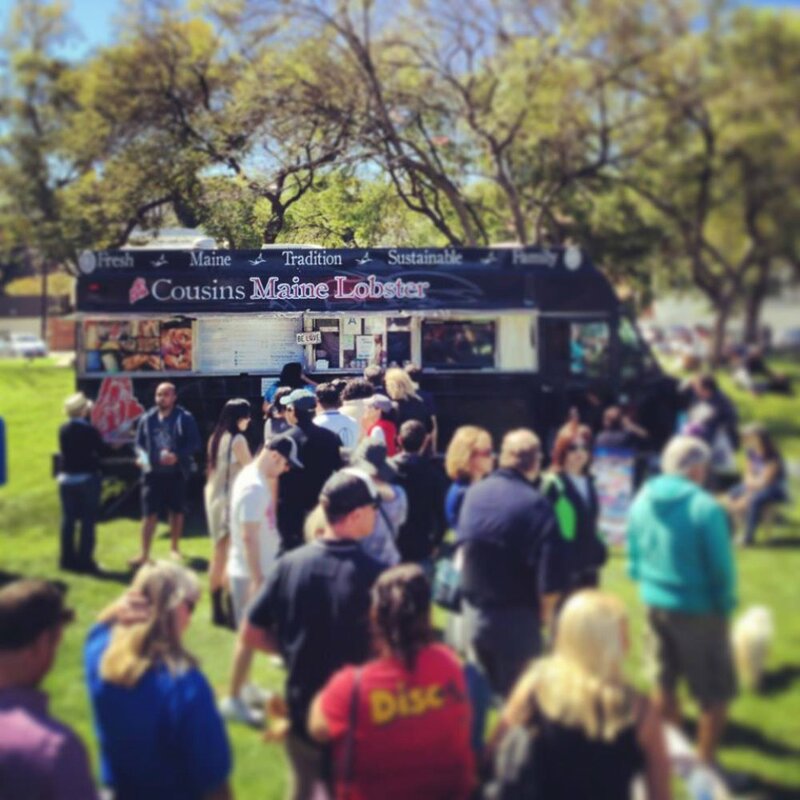 One of the hardest-working food trucks in LA, Cousins is often the first to be found at events, street festivals and anywhere else in need of fresh Maine lobster. Aside from the obvious lobster roll (served chilled Maine-style with mayo, or warm Connecticut-style with butter), the truck’s treasured crustacean can be found in everything from quesadillas to grilled cheese to even tots, and it’s all done so impeccably, you’ll remember why it became a million-dollar investment to begin with. Lobster Roll – The menu’s lovely, but if the mood is calling, get the classic – chilled with a touch of mayo on a New England roll, and call it a day. The kind of day you’ll wanna re-live over and over again. 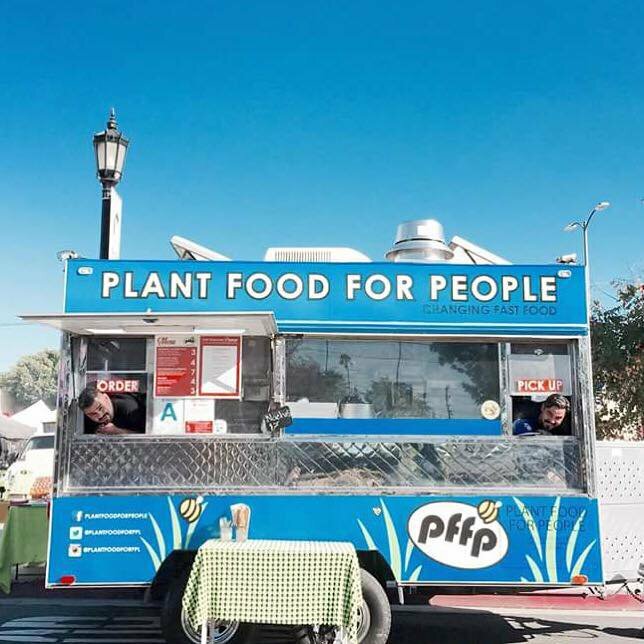 Plant Food For People has been making vegan dreams come true ever since it sprouted in East LA, delivering conscious comforts that don’t just taste great, but do great things – for you, for the community and, naturally, for the planet. Jackfruit tacos, along with burritos, tortas and ricebowls, line a menu packed with power, and more importantly – a whole lotta taste. Track down the truck to get your fill of earth-friendly eats, and you’ll be doing your part for a sustainable future. Specifically, the eating part. We trust you can handle it. The Bowl – slow-cooked pinto beans layered with Mexican rice, jackfruit, tomatillo, coleslaw pico de gallo and a chipotle aioli. Altogether, it’s a meal capable of converting the meanest carnivore you know to a friendlier diet. 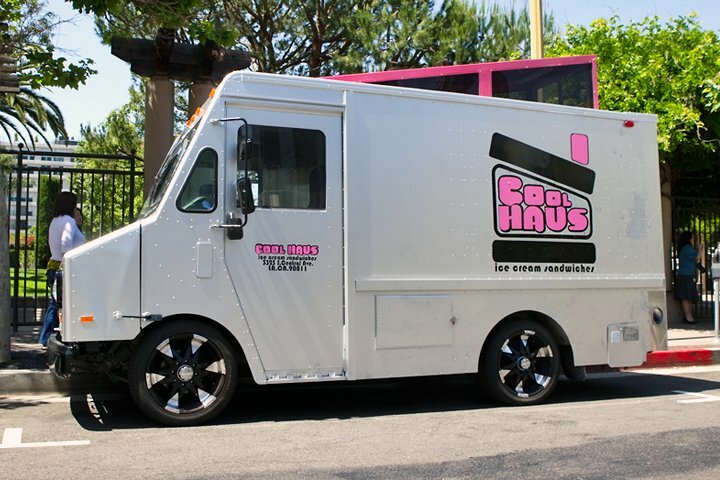 By far one of the biggest success stories from LA’s first wave of gourmet food trucks, Coolhaus creations can now be found in grocery stores nationwide, but if you wanna get the real deal, straight-from-the-source stuff, the truck itself is where you need to roll. And lucky for you – it’s still everywhere. Coolhaus’ core flavors range from green tea to chicken and waffles and even potato latke/apple sauce, giving you layers of odd, delectable variety. And that’s just to start – Coolhaus’ roster of cookies provides a whole second level of delicious diversity, giving you a full custom grip on your treat. Choose your own custom masterpiece, and find out why this truck’s graduated to new American icon status. Salted Chocolate Ice Cream Sammie – Salted chocolate sandwiched between two chocolate chip/Snickerdoodle cookies, giving you a pinch of savory to round out all the rich sweetness. 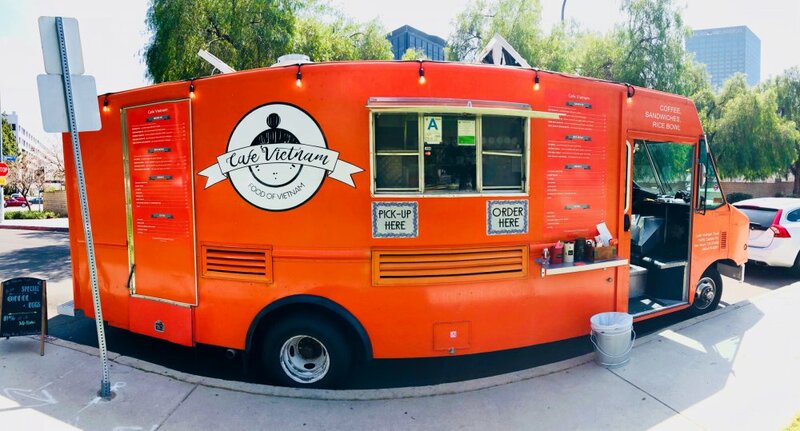 Owned and operated by Nha Trang native Trang, Cafe Vietnam was designed to fill a pressing gap in LA’s food truck culture – one screaming to be filled by fine Vietnamese cuisine. It’s a gap Trang has been filling block by block and stop by stop since her truck launched, with a menu of playful, authentic banh mi and rice bowls, stuffed with ingredients like braised pork belly and freshly-ground chicken meatballs. A rotating crop of seasonal items (like egg rolls and pork belly mac & cheese) round out the offerings, giving you extra reasons to keep coming back to Trang’s mobile paradise. If you need something like “extra” reasons, that is. Pork Belly Fried Rice – Heaps of coconut-braised pork belly mixe with veggies, three scrambled eggs and one over-easy egg that flows through the whole shebang & unifies all flavors. 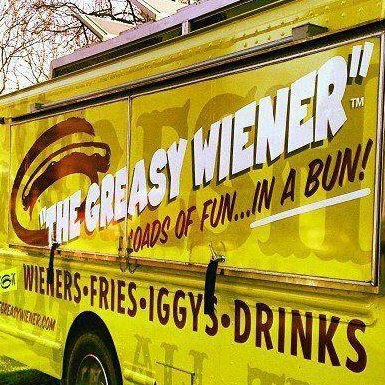 What it lacks in subtlety, The Greasy Wiener more than makes up for in certified taste, texture, and overall excess. In their own words – it’s the most fun you can have between buns. A sleek, multimedia-friendly (short films & music videos entertain you while you wait) food truck belies the old-fashioned, Jersey-style comforts onboard. The main attraction is the fried, hand-twisted, no-filler hot dogs, which come in several varieties – all of them evoking Jersey boardwalk summers…..or at least the only part worth evoking – snack time (gym/tan/laundry is up to you). Chili, bacon and kosher pickle spears are just a few add-ons that add a whole lot of extra pow, while burgers and jumbo sausages add a different category of eats altogether. Any way you choose to chow down, you’ll be choosing a damn good time. The kind of good time you can only get between buns. The GW – All-beef dog prepared from a family recipe, featuring grilled onions, mustard and a kosher pickle spear. Add on sauerkraut, homemade cheese sauce, or homemade chili to complete your hot dog heaven. 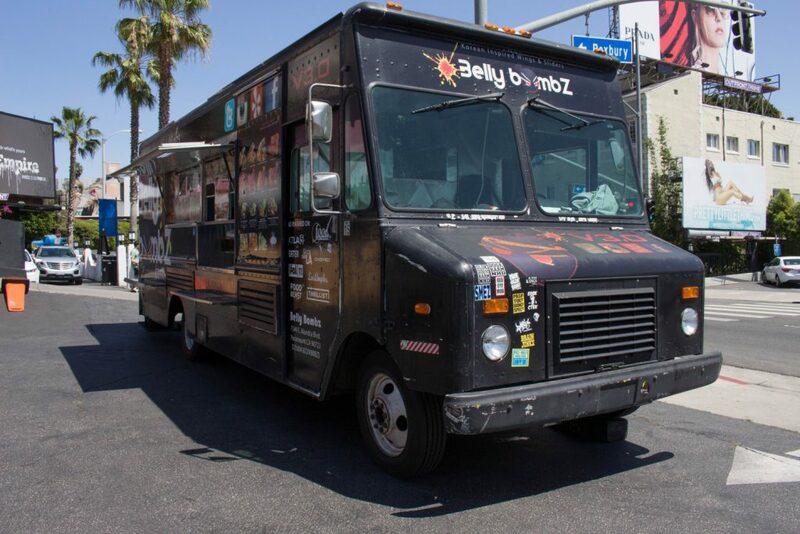 Speaking of buns, our final truck on the list is something of a pro. Son of a Bun was established in 2013 with a basic, frills-free concept: keep it all as fresh as possible. The burgers are hand-pressed, the chicken is marinated for 24 hrs, and the hot dogs are to wrapped to snap the moment you bite into them. There’s never any hormones used, and all the produce is locally-sourced. The truck’s final touch is its trademark SOB fries, golden-crisped and tossed in the truck’s signature blend of spices til they taste like no other fries on the block. Finally, coleslaw and seasonal salads provide a cool contrast to all the heartier fare. 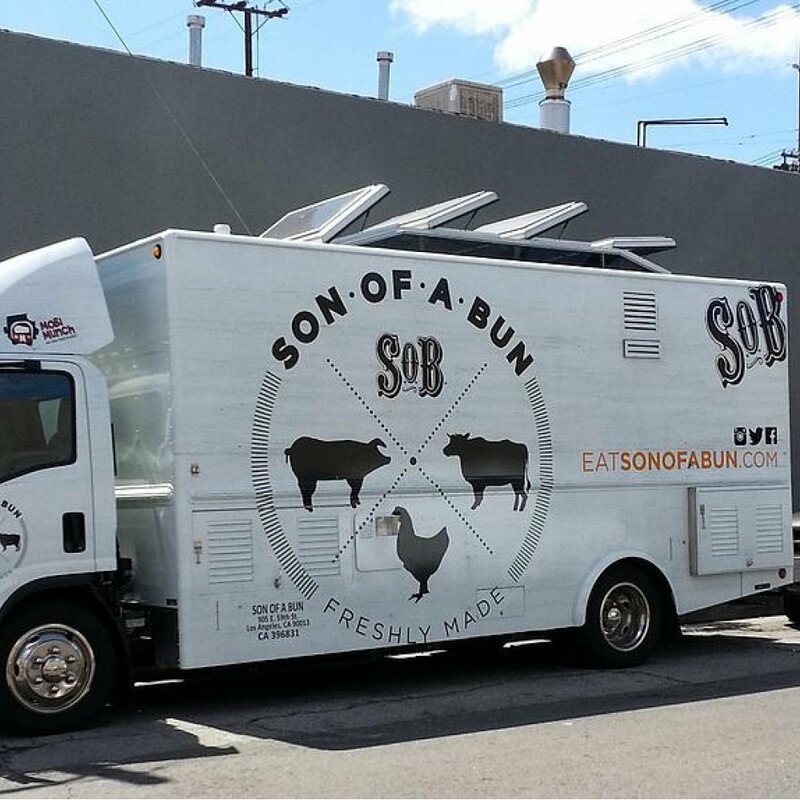 By keeping it basic, Son of a Bun tastes anything but, and has weathered the LA food truck wars to emerge one of the toughest, tastiest and most dependable trucks in town. Avoegg Burger – A lot easier to eat than pronounce, with a sizzling patty topped by avocado, American cheese, grilled onions, pesto aioli and an over-easy egg. If one really has to work, working in Los Angeles has its obvious benefits – beach, sun, sand, views and tacos. Not necessarily in that order. In fact definitely not in that order. If you happen to be in charge of office catering, you’ve already failed if you neglect your surroundings. Or more specifically – your tacos. But figuring out where to start can be the challenge here as the number of taco trucks here rivals the number of palm trees. Booking corporate catering for a Los Angeles office full of NY expats, especially new ones, presents unique challenges, but twice as many opportunities – not just to please your east coast coworkers’ nostalgia, but to help them embrace their new home just a little bit harder. Or a lot, really. 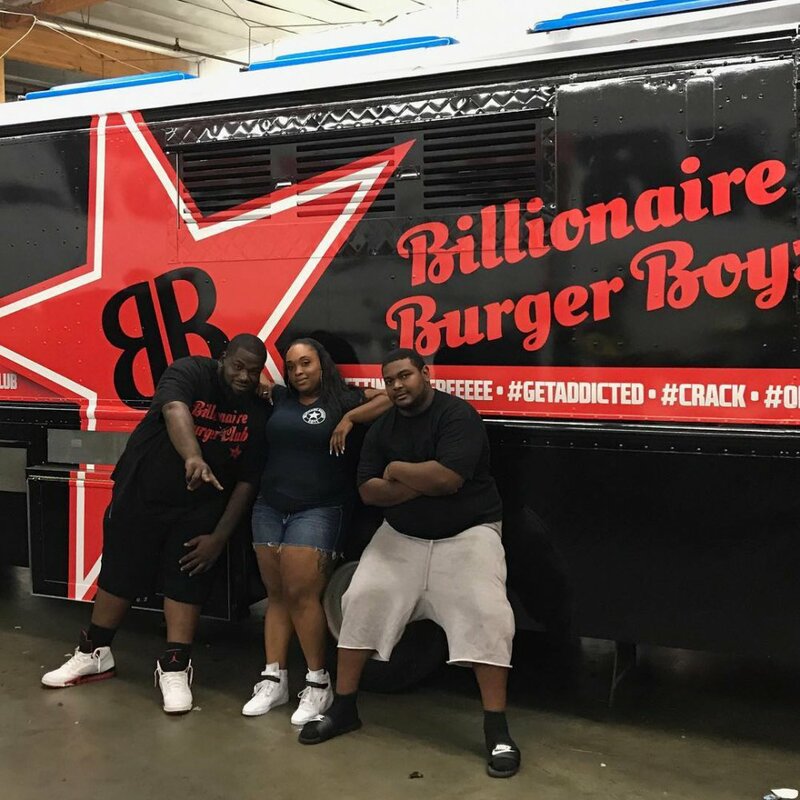 Booking a food truck is a chance to give them the best of what they thought they’d left behind, alongside the best of what they’ve suddenly gained. When given the chance to actually stop, eat and enjoy, there are plenty of lunch options… and range from braving the unholy swarm of agents waiting in line at Eataly, to braving the unholy bills at local fine dining monstrosities. If you’re stuck in the 20thfloor executive suite, however, you can make lunch a whole lot easier on everyone. Order some corporate catering that’ll lift spirits, feed quickly, and most importantly – come straight to you. You’ll give the office the Century City escape it deserves. Especially if it’s gonna be a while until anyone in the office, you know, gets to escape Century City.